The stovetop espresso maker (or moka pot) is one of the most steadfast brewing methods out there. We wanted the best of the best, so we spent one week brewing coffee in over 37 different stovetop models. There are many excellent options available, but we’re especially confident in recommending the Bialetti Espresso Maker as the best option for most coffee lovers. An old-school coffee maker, the stovetop espresso maker (aka moka pot) has become a staple in the kitchen for coffee enthusiasts everywhere. While at first glance it seems like brewing coffee this way might be complicated, the truth is that it’s actually incredibly easy (and tasty!) to do. If you are currently looking for a quality moka pot, make sure to read this article to learn about important factors to consider. We’ll also give you a list of highly rated, reviewed, and tested stovetop espresso models that you can use as a jumping-off point for your research into buying one. Our shortlist of moka pots is made up of 5 different models that we’ve tested and used extensively. Any one of these options will provide an excellent stovetop espresso brewing experience. Made in Italy, the home of delicious coffee. Can brew coffee fast thanks to its octagonal shape. It comes in different sizes: 1, 3, 6, and 9 cup sizes. It works with electric stoves but it is not exactly designed for that. Expect a dip in quality if used with an electric stove. 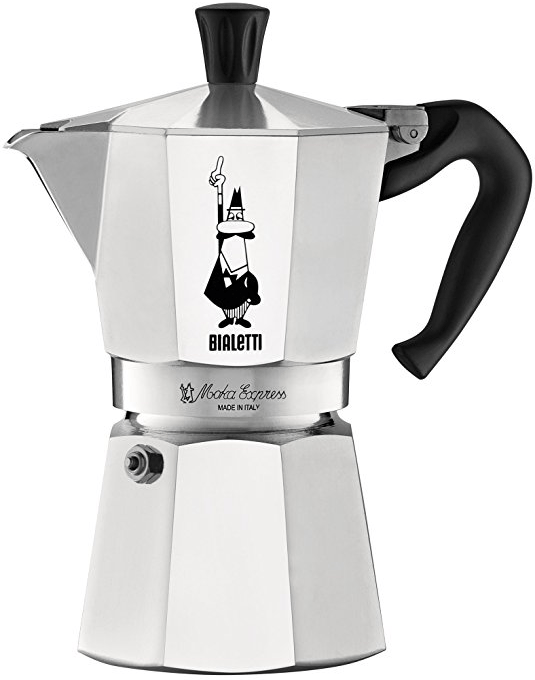 If you are looking for a stovetop espresso maker, you can’t really go wrong with Bialetti. It has always been the premier brand name in this market and its stovetop espresso maker is definitely one of the best around. It uses a rather unique style with its design as you can clearly see from looking at it. 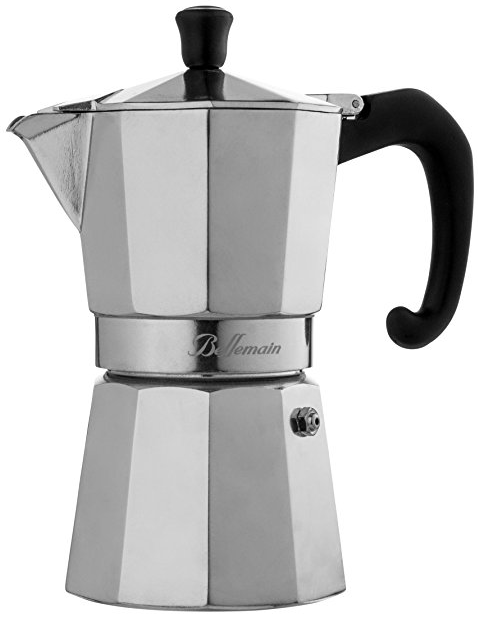 Compared to other Moka pots, the Bialetti uses an octagonal shape for its main body. The reason for this is more scientific than merely a ‘fashion statement’ though. The octagonal shape of the pot actually helps in distributing heat inside properly. This also makes brewing espresso quite fast as you can be done within 5 minutes. This is also made by an Italian manufacturer so you can pretty much guarantee its quality when it comes to preparing coffee. The Bialetti Espresso Maker is available in different sizes so you can choose whether you want a 1-cup or maybe the 9-cup option. Cleaning is just as easy here as you can disassemble this pot quite easily. When it comes to a reliable espresso maker, you can’t go wrong with Bialetti. It has proven time and time again that when it comes to traditional espresso makers, it is one of the best options available. Heavy base prevents it from easily tipping over. Heating can take up to 15 minutes due to the heat regulating design. The Bellemain Stovetop Espresso Maker is an entry-level coffee maker that can prepare up to 6 2-ounce cups. What makes this quite a good choice is the fact that it is designed to be compatible with both gas stovetops and electric stovetops. Bellemain features a more traditional design and uses the aluminum material. This means you can heat and blend coffee but also means you should handle this with extra care. 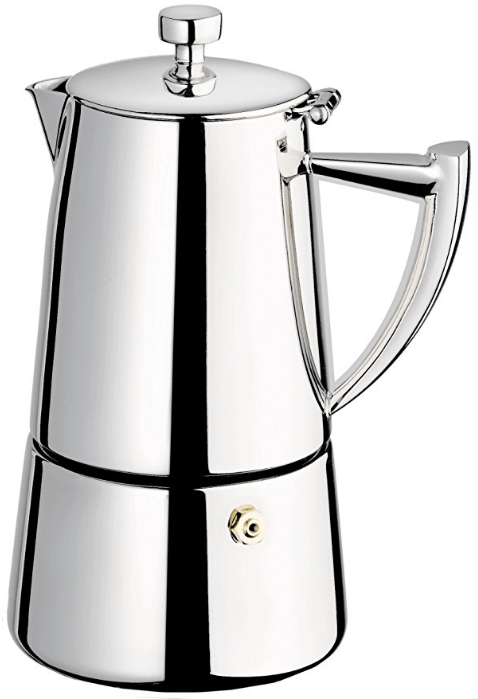 Aluminum also prevents your coffee from acquiring metallic aftertaste which is an issue with stainless-steel espresso makers. The simple minimalist design is improved by a sturdy construction. While it does utilize aluminum material, it feels quite durable – and with parts designed for practical use rather than the style, you can expect to avoid problems during use. As for safety features, the Bellemain uses heat-resistant handles and lid knobs. It is also designed to regulate heat and pressure build up properly so that there is less risk of overcooking the coffee beans. Cleaning the Bellemain is also incredibly simple and easy as you only need to rinse and dry this espresso maker, no need for scrubbing or dishwashers. A combination of elegant design and practicality. The product also came with an extra gasket. Screen filter lets you determine how many cups you wish to blend. One of the most expensive espresso makers. The handle is susceptible to heat. The Cuisinox Roma is another highly recommended espresso maker. In terms of design, the Cuisinox Roma features a simple and traditional approach. It is also handcrafted which further adds to its overall elegance. It is made from heavy-duty stainless-steel material and with a wide base to help improve its stability. The smooth design of the pot combines that rustic feel with a twist thanks to the chrome stainless-steel body. The problem I had with using the Cuisinox Roma is that the handle can sometimes get too hot for comfort. The Roma can prepare 6 to 10 cups of espresso. Cleaning is also quite easy to do. It is large enough to be used on both electric and gas stovetops as well. The price might be too steep for some though. Sleek black or white finish. It comes with several safety features. This is not a dishwasher-safe espresso maker. 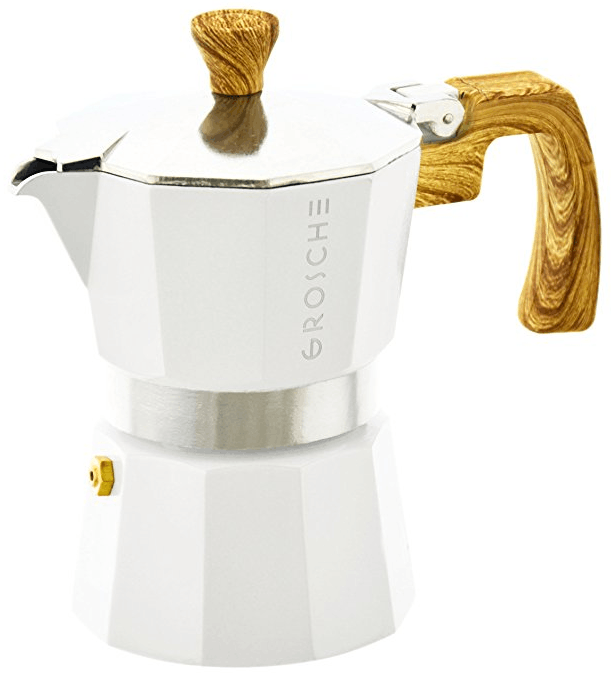 The GROSCHE Milano is an aluminum espresso maker that can brew up to 9.3 ounces or 6-cups of espresso in one go. It can also work with both electric and gas stovetop so modern homes can also use this to enjoy a good cup of joe in the morning. This espresso maker is designed to be as safe as possible. It is covered with safety features that should prevent your skin from touching the hot surface. The handle is also spaced well away from the pot itself. It also incorporates a safety valve into its design that is used to regulate pressure inside the pot. This valve releases some steam whenever the pressure is getting too high inside the pot. As I do love the color black, forgive me for being a little bias with the GROSCHE Milano as its sleek matte black finish looks amazing in almost any kitchen. This finish protects it from stains while also being quite easy to clean. One of the cheapest stovetop espresso makers. Rubberized handles are completely heat resistant. Some design flaws like the uber narrow spout. Not compatible with all induction stovetops (make sure the stovetop has a diameter of 4-inches and not larger). 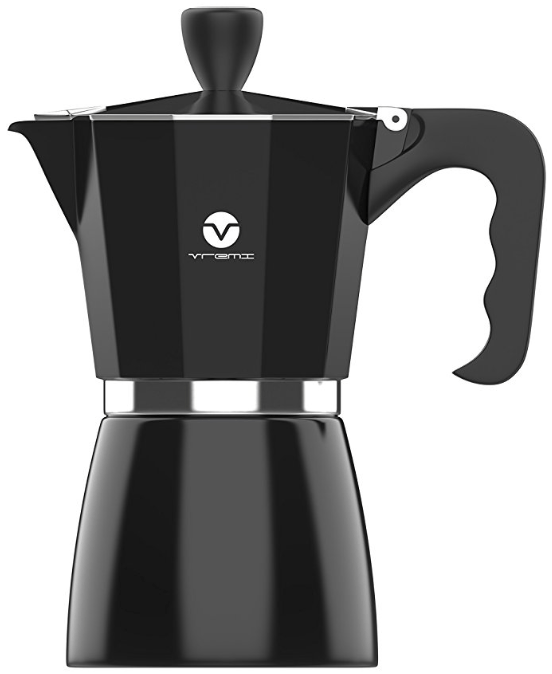 Another espresso maker with a sleek black look, the Vremi Stovetop Espresso Maker is not just ‘sizzle’ as it delivers the ‘steak’ as well. The Vremi can easily prepare up to 6 cups of espresso in one brew. It takes about 5 minutes to complete the brewing process which is a good time. The Vremi Espresso Maker definitely feels sturdy and the rubberized handle helps protect your hand from the hot surface. I always prefer appliances that have a compact and space-saving design to it which is why I enjoyed using the Vremi as it can fit neatly in my kitchen cabinet or on the counter. It is pretty easy and simple to use as well which is why I would also recommend this for entry-level coffee lovers. The criminally low-price tag is also a huge plus for those looking for something reliable yet budget-friendly. I do have a comment about the narrow spout. Pouring the espresso into your cup will need a more careful approach as the narrow spout can cause some spills. Take it slow when pouring this to avoid the need to clean up after. Before buying your very own stovetop espresso maker, it is best to understand what makes a great espresso maker. Read the guideline below to find out what factors to look for as well as what important questions to ask for. Who is the manufacturer and where was it made? If you want a reliable product it is best to go for ones manufactured by a well-known brand. A little research will net you a list of the best brands that make stovetop espresso makers. However, if you want the best, nothing beats a Moka pot made by an Italian company. Of course, these stovetop espresso makers tend to be more expensive but the extra bucks you spend are well worth it. How many cups can it prepare? Consider who will be regularly using this espresso making machine. Will you be the only one drinking or will you be sharing the rich tasting espresso with someone else? If you are planning on making more than one cup then go for espresso machines that can brew multiple cups in one go. This will eliminate multiple trips to the machine and cut prep time considerably. Is it compatible with your stovetop? If you are using an electric stove then be aware that not all stovetop espresso makers are designed to be compatible with that type of stovetop. Always check to see whether the espresso maker you are planning on buying is compatible with both induction and gas cooktops. The last thing you need is to get home and find out that you can’t use your brand-new espresso maker. Espresso makers usually utilize two types of materials for its body: stainless-steel and aluminum. There are little differences between these two materials which should help you decide which one suits you better. For example, stainless steel is best if you want to heat water faster as it is a great heat conductor. On the other side of the spectrum, aluminum is cheaper and are good for those who are worried about burning themselves as it can maintain a pretty low temperature. Stainless-steel looks better aesthetically as well if you are looking for something that you can flaunt in your kitchen. For everyone, there are a couple of things in life that are worth investing good money in. For coffee lovers, those things are often coffee/espresso makers. A high quality stovetop espresso maker or moka pot is well worth your hard-earned money – you won’t regret buying one. Use this guide to find the best moka pots out there, and you’ll be sipping a deliciously home-brewed cup of espresso in no time!